Welcome! Ebook Central is your resource for ebooks providing breadth and depth of authoritative content, courtesy of your Connelly Library. 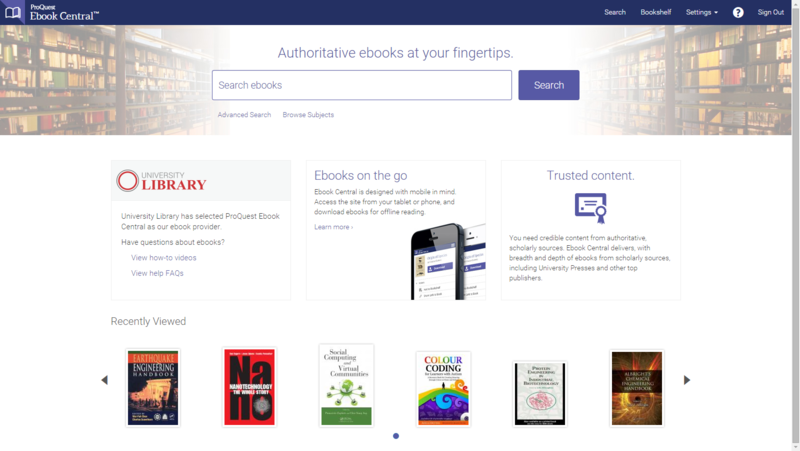 More than 170,000 ebooks from scholarly publishers. Formerly called ebrary. A growing and changing collection of 170,000+ e-books in many different academic subject areas, ebrary includes works from university presses and other academic publishers first published in recent decades, but also selected classic works dating as far back as William Harvey's Circulation of the Blood, originally published in 1628. Nearly all works are in the English language, though some are in other European languages (German, French, Spanish, Portuguese, and Dutch).